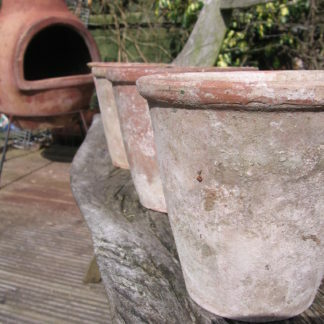 These pots are perfect for Pelargoniums for the conservatory or summerhouse. Hand thrown, and with years of use, they combine wonderful texture and a white patina. Planted up in groups of three or five on a windowsill with your favourite choice herbs, these pots are the ideal gardeners’ gift. Available to buy as singles or offer prices available in threes.